Green People's Organic Children Sun Lotion SPF 30 is a high factor, natural sun lotion suitable for children with sensitive skin and prone to prickly heat. Pour a generous amount of sunscreen into your cupped palm then liberally apply to body 20-30 minutes before exposure to sun then every 2 hours or after swimming. 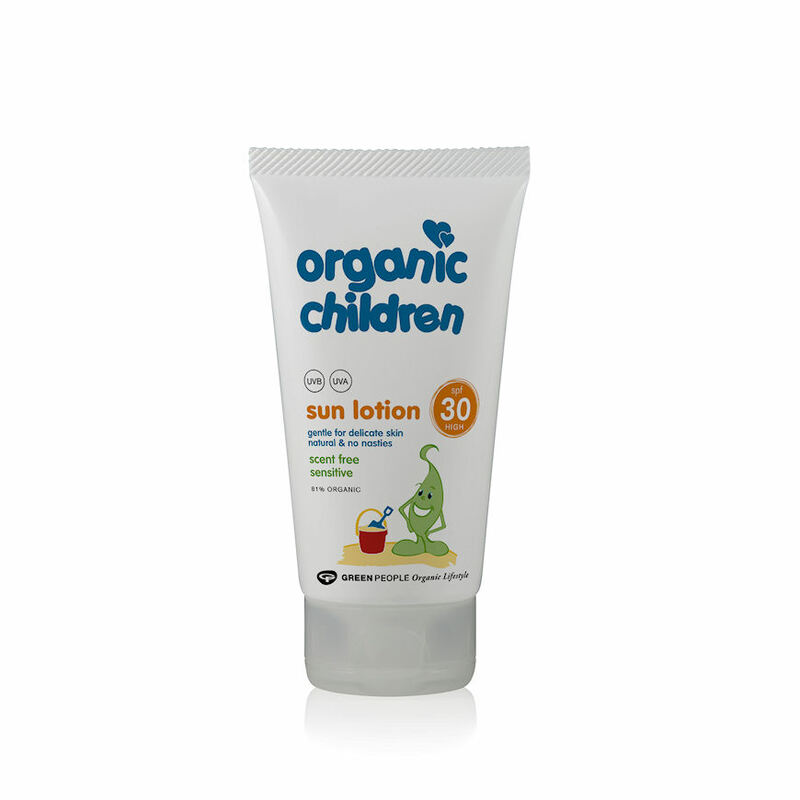 To soothe the skin after sun exposure, try Green People’s Organic Children Aloe Vera Lotion & After sun which has a wonderful cooling effect as well as locking moisture into the skin to keep it soft and supple. Aqua (spring water), isoamyl p-methoxycinnamate (naturally occurring uv-filter), olea europaea (olive) fruit oil*, helianthus annuus (sunflower) seed oil*, elaeis guineensis (palm) oil*^, titanium dioxide [nano] (mineral uv-filter), diethylamino hydroxybenzoyl hexyl benzoate, cetearyl alcohol (emulsifying plant wax), glyceryl stearate (plant derived emulsifier), cetearyl glucoside (plant derived emulsifier), cera alba (beeswax)*, aloe barbadensis (aloe vera) leaf juice powder*, persea gratissima (avocado) oil*, leontopodium alpinum (edelweiss) leaf extract*, commiphora myrrha (myrrh) oil^, rosmarinus officinalis (rosemary) leaf extract*, sodium stearoyl glutamate, gluconolactone, sodium benzoate, sodium dehydroacetate, phytic acid.